His early interests were law and he served as a Congressional Intern in Washington, D.C. during college. He could have been a successful corporate lawyer or a dedicated public defender. He could have been a skillful politician. Everyone knows he got plenty of practice at both. But instead he chose medical school and the field of psychology, eventually running a large health care organization in Boston, MA. Doc chose to devote his substantial talents to surfing and making the ESA something special and different in the world of surfing. Doc had the amazing ability to attract talented people, nurture them, delegate jobs to them and then sit back and let them run. He always knew intuitively where he wanted the ESA to go on any given issue and his work ethic and dedication inspired those around him to perform at their highest level towards his goals which became the goals of the organization. He was part friend, part father figure, part benevolent dictator and his vision, philosophy and plain hard work brought the ESA from a small surfing club of 300 members to the leading surfing organization in the world, with over 2000 members at the time he passed away. Today the organization boasts over 6,000 members, part due to what he did, how he thought, and the values he instilled in the organization. To this day, the ESA is something special in the world of surfing and different from every other organization currently in operation. 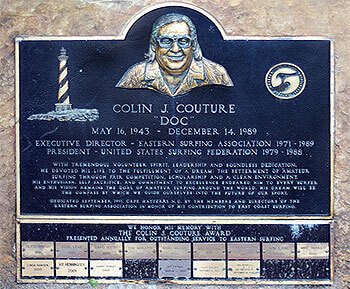 Doc was an original, one-of-a-kind individual and one of the truly important figures in the history of surfing. Doc made it his business to keep the ESA focused on what was really important about surfing; the kids, the environment, working hard for surfing, having a great time with friends and always trying to do the best he could to help others. In his mind, being the best surfer was nowhere near as important as being the best person; giving of yourself for others for no reason other than that it was the right thing to do.